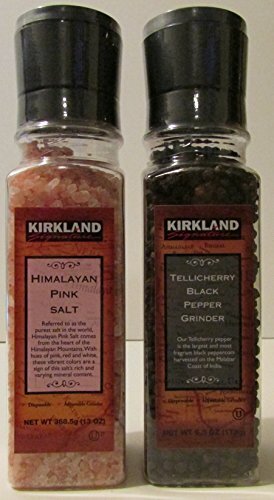 Bundle of one 6.3 ounce bottle of Kirkland Signature Tellicherry Black Pepper Grinder and one 13oz Himalayan Pink Crystal Salt Grinder. The Tellicherry pepper is the largest and most fragrant black peppercorn harvested on the Malabar Coast of India. The gourmet salt is hand-mined deep inside the pristine Himalayan Mountains. The salt, while being locked within the earth was infused with minerals over millions of years leaving its mark in its rich color and taste. The high mineral content of the Himalayan salt crystals range in color from white to deep reds. The darker the color the more minerals that are in the crystals.